Remove faded flowers from rhododendrons, lilacs, camellias, azaleas and pieris etc. 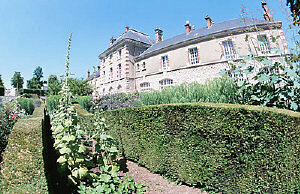 Clip hedges and begin training topiary plants. 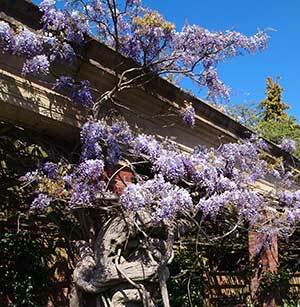 May is the time of year when the most flamboyant of trees and shrubs come into full bloom. Several ornamental cherry trees will still be in flower at the beginning of the month, followed by masses of white and pink May blossom (hawthorn) filling the hedgerows. In addition to the massed blooms of lilacs, rhododendrons and azaleas, will be a spattering of decadent bright yellow trailing laburnum, plus the most grand and ostentatious of all shrubs; the ancient and magnificent Wisteria (shown right), which will trail down buildings and spill over pergolas, to the delight of all. May is the best time to deadhead rhododendrons and azaleas as the individual flowers fade, so the they waste no energy in setting seeds. The bushes will look neater for it, as some varieties have a bad habit of refusing to shed their faded flowers. Also deadhead flowering camellias and pieris the same time. You can begin to plant out tender shrubs in May, such as fuchsias. Keep all newly planted shrubs well watered if the weather is dry. Established plants can be watered with a liquid-feed if necessary or a general fertiliser added around the roots. Many of the quick-growing hedges such as thorn, privet and evergreen honeysuckle (Lonicera nitida) will need to be checked for excessive growth. Often a light trim now is better than leaving trimming too late, and having to prune drastically as a result. Regular trimming encourages compact, bushy growth, which is exactly what you want in a hedge. Evergreen barberries (Berberis darwinii, B. x stenophylla) grown as hedges can be clipped back after the flowers fade. If you have a long run of hedge, it could be worth while investing in an electric trimmer which will make the work easier. Finally, continue pruning any ornamental shrubs that have finished flowering so they can produce more flowering shoots next year. Keep watch for the appearance of greenfly, black spot, mildew and rust. It's also a good idea to check roses now for any suckers that may have appeared round the base of the plant. Most modern varieties are grafted onto a rootstock of a more vigorous species, which means that the roots are from one plant, and the stems, leaves and flowers (that comprise the named variety) from another. Suckering is an attempt by the rootstock to start a life of its own by sending up shoots. If these sucker shoots are not removed promptly, all the strength of the roots will be diverted into them. The rootstock will eventually take over, and the named variety rose will die. Usually suckers are easy to recognize, as some stocks produce lighter green shoots that should look entirely different from the normal growth, but this is not an infallible guide. To be on the safe side, trace the suspected sucker back to its source. This will probably mean scraping a little soil away from the base of the plant to see where the sucker comes from. If it comes from below the budding union it is a sucker. To remove it (wearing thick stout garden gloves) pull it away from the root rather than cut it of. This is the only way of making sure that no dormant buds are left behind to form new suckers. Never just cut a sucker off at ground level. All you will be doing then is pruning it and encouraging more strong growth.